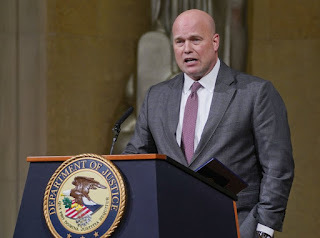 WASHINGTON (AP) — Acting Attorney General Matt Whitaker told Republican Sen. Lindsey Graham in a meeting on Thursday that special counsel Robert Mueller’s investigation will proceed, according to a person familiar with the meeting. The meeting with Graham and Whitaker comes as a bipartisan group of senators is pushing legislation to protect Mueller’s job. The senators are concerned about Whitaker’s past criticism of the Mueller probe, which is looking at Russian interference in the 2016 election and ties to President Donald Trump’s campaign. Those concerns were only amplified after Trump appointed Whitaker as acting attorney general last week. Whitaker told Graham the investigation would be allowed to proceed, the person said. The person wasn’t authorized to speak publicly about the meeting and spoke to The Associated Press on condition of anonymity. Senate Democratic leader Chuck Schumer and other Democrats have called for Whitaker to recuse himself from overseeing the Mueller investigation. Democrats have also called for the special counsel bill to be added to a year-end spending bill that must pass in December to avoid a partial government shutdown. The bipartisan legislation, which was introduced more than a year ago, would give any special counsel a 10-day window to seek expedited judicial review of a firing and put into law existing Justice Department regulations that a special counsel can only be fired for good cause. On Wednesday, Republican Sen. Jeff Flake said he would not vote to confirm judicial nominees unless GOP leaders hold a vote on the Mueller protection legislation. Whitaker is now overseeing the Mueller probe, which had previously been overseen by Deputy Attorney General Rod Rosenstein. Rosenstein told Congress that he saw no reason to fire Mueller. Recently ousted Attorney General Jeff Sessions had recused himself from overseeing Mueller because he had worked on Trump’s Republican campaign — a decision that infuriated Trump and led to Sessions resigning at the president’s request. Trump has repeatedly criticized Mueller and called the investigation a hoax.